If you start with a normal, healthy dog and give him time, patience and some carefully executed lessons, you will reap the rewards of that training for the life of the dog. And what a life it will be! The two of you will find immeasurable pleasure in the companionship you have built together with love, respect and understanding. 1. Think Before You Bark; Dogs are sensitive to their masters' moods and emotions. Use your voice wisely when communicating with your dog. Never raise your voice at your dog unless you are trying to correct him. "Barking" at your dog can become as meaningless as "dogspeak" is to you. 2. Language Barrier; Dogs do not understand our language and have to rely on tone of voice more than just words or sound. They can be trained to react to a certain sound, at a certain volume. If you say "No, Oliver" in a soft, pleasant voice, it will not have the same meaning as "No, Oliver!!" when you raise your voice. You should never use the dog's name during a reprimand, just the command "No!" you never want the dog to associate his name with a negative experience or reprimand. 3. Command Stance; Stand up straight and authoritatively when giving your dog commands. Do not issue commands when lying on the floor or lying on your back on the sofa. If you are on your hands and knees when you give a command, your dog will think you are positioning yourself to play. 4. Take The Lead; Do not carry your dog to his relief area. Lead him there on a leash or, better yet, encourage him to follow you to the spot. If you start carrying him to his spot, you might end up doing this routine forever and your dog will have the satisfation of having trained you. 5. Calm Down; Dogs will do anything for your attention. If you reward the dog when he is calm and attentive, you will develop a well-mannered dog. If, on the other hand, you greet your dog excitedly and encourage him to wrestle with you, the dog will greet you the same way and you will have a hyperactive dog on your hands. 6. Practise Makes Perfect! ; Having training lessons with your dog every day in several short segments- 3 to 5 times a day for a few minutes at a time is ideal. Do not have long practice sessions. The dog will become easily bored or stressed. Never practice when you are tired, ill, worried or in an otherwise negative mood. This will transmit to the dog and may have an adverse effect on his performance. Think FUN, short and above all POSITIVE! End each session on a high note, rather than a failed exercise, and make sure to give a lot of praise. Enjoy the training and help your dog enjoy it too. 7. Consistency Pays Off; Dogs need consistency in their feeding schedule, exercise and relief visits, and in the verbal commands you use. If you use "Stay" on Monday and "Stay here, please" on Tuesday, you will confuse your dog. Don't demand perfect behavior during training sessions and then let him have the run of the house the rest of the day. Above all, lavish praise on your pet consistently every time he does something right. The more he feels he is pleasing you, the more willing he will be to learn. 8. Training Rules; If you want to be successful in training your dog, you have 4 rules to obey yourself: 1. 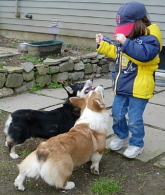 Develop an understanding of how a dog thinks. 2. Do not blame the dog for lack of communication. 3. Define your dog's personality and act accordingly. 4. Have patience and be consistent. 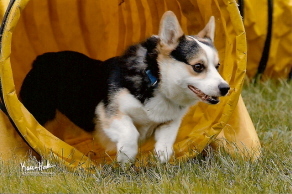 Agility is a fun sport for you and your dog! Click on the link below for affordable agility equipment.